Nothing says "summertime" like a juicy, ripe peach. Eat them while they are in season and fresh. Yum! Blend all ingredients in your food processor or Vitamix, adding the sesame seeds and tahini last. This no-bean hummus is an adaptation Dara Dubinet's recipe. Beans contain both a starch and a protein, making them harder to digest. Beans can also leave you feeling bloated. This raw, bean-free hummus is light and filling, and will satisfy your cravings for some creamy hummus. Blend all ingredients until smooth. I like to eat this with bell peppers - so refreshing and summery! Blend all ingredients until smooth. This summer smoothie recipe is filling, refreshing, and creamy! This veggie pasta took about ten minutes to make, but was incredibly savory. It is a new favorite for sure. Spiralize the zucchini and place in a bowl. In a saucepan, melt the coconut oil and sauté the onion and garlic for about a minute. Add the chopped broccoli and stir. Once the broccoli begins to brown, add the tomato and herbs. Pour mixture over the zucchini and top with pepper and nutritional yeast. I am eating so many berries this summer. It is best to eat foods that are in season - not only because they taste better, but also because they are cheaper! So, I have been getting my fill of berries and all the the wonderful antioxidants they have. One cup of raspberries provides over 1/3 of your daily dose of fiber and 1/2 your daily Vitamin C. They benefit your gastrointestinal system, too. Blueberries help neutralize the free radicals in your body, which cause issues at the cellular level resulting in premature aging. These berries are great for your heart, your vision, your intestines, and your brain. They contain Pterostilbene which has even been proven to prevent and cure colon and liver cancer. There are many more benefits to eating an abundance of berries, but probably the best reason is that they are delicious! Chia and Flax seeds are both higher in Omega 3 than Omega 6 fatty acids meaning they have the proper balance and ratio. Most seeds are a lot higher in Omega 6 than Omega 3 which will result in an improper balance if eaten too often. These seeds will also provide some added protein and sustained energy to the meal. Blend the banana, chia seeds, and almond milk until smooth. Top with the berries, flax seeds, and drizzle with honey. 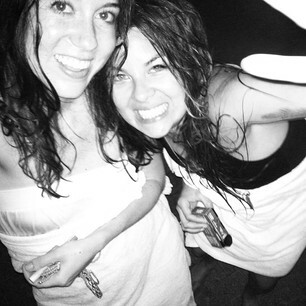 I had an amazing time in Costa Rica last week with one of my best friends, Brandi (from mucho mucho bueno bueno). We will both be adding posts about our adventures together so keep checking back for updates. Our friend Ashley came along, too and we celebrated my birthday all week! We did everything from surfing, zip-lining, horseback riding, white water rafting, and much more. Brandi and her sister Kelly have been telling the world all about music, style, hair, and travel through their blog. They were a huge part of the inspiration behind AWV and I think you should all go follow their blog, too. Look, it's me on top of the Capitol Records building! I recently went to LA for work and had an awesome time. There is so much great food in this city! I was shocked to find raw food restaurants and juice bars all over the place. I could search "raw" or "vegan" on Yelp and find several options just around the corner from my hotel. You don't get that kind of variety in Nashville. I'd heard Dara Dubinet mention this place several times, so I knew I had to try it. With a little spare time in between work events, I drove to Santa Monica to check out this restaurant. Taking my food to-go, I walked down to the beach and ate alone in the sunset. It was amazing. ELR is a completely raw vegan restaurant with numerous options of delicious, gourmet food. If you don't want to spend all day chopping, mixing, and dehydrating - let ELR do the work for you! 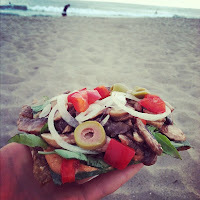 I got a raw Italian pizza made with dehydrated raw onion bread, cashew cheese, and loaded with veggies. The great thing about dehydrated foods is that they are all natural, raw, gluten free, plant-based, and living! Life Food Organic: Key lime pie… yes, please! This was the real deal. Made from nuts and limes, this pie was completely raw, completely vegan, and completely good for me. What I love about raw vegan desserts is that they are guilt-free! When you eat a whole-food such as fruit, you can eat it abundantly. I loved the layers in this pie and would love to try to make my own recipe soon. I went back to this spot the next day because I was craving some green juice. They had several fresh options, and I picked some spinach, kale, apple, lemon, ginger juice. Yum! If you're looking for a quick option, this restaurant has many foods prepared for take-away. Cafe Gratitude was about a mile from my hotel…so I went there everyday! They are another raw restaurant with an awesome breakfast, lunch, dinner, dessert, and juice menu. Check out this breakfast - banana chia seed crepe with fresh fruit, coconut cream, and pecans…amazing. Have you ever added ginger to your orange juice? Jenn added a fresh ginger shot to my juice one morning and it was so tasty and refreshing. Two thumbs up!